Do you remember watching scary movies when you were a kid and sometimes there was a monster or creature that ate everything in site? Things just disappeared and were never seen again. Fast forward a few decades and the monster is back...but it's in our house this time! 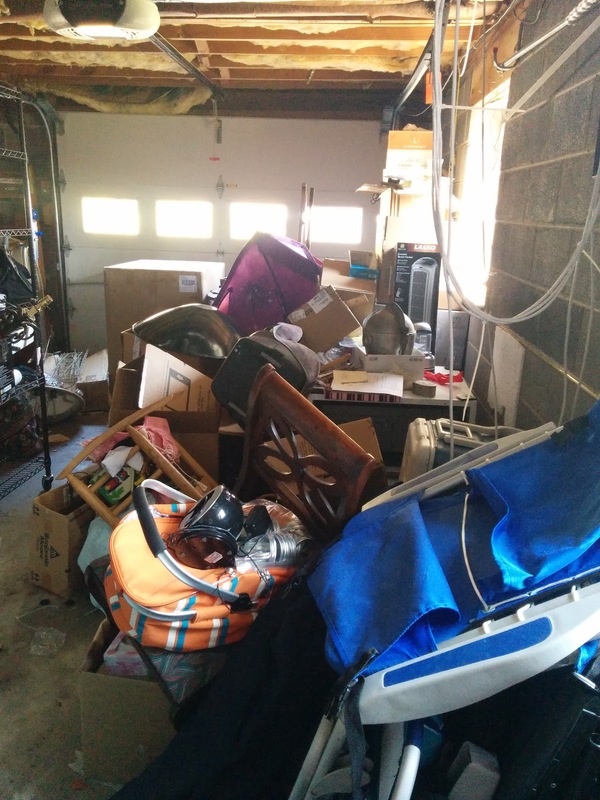 If I asked you what the messiest, most disorganized space in your home is, there's a really good chance that you'd say the garage. For many people including us, that space becomes a place to temporarily store things that you don't know what to do with (translation -- dumping ground). It doesn't have to be that way. Here's what we've created...a real live monster. We've fed it over the past few years until it's grown into this! Organizing it has been on our to-do list for a while but we haven't gotten to it before now because, well, life just gets in the way sometimes and we don't make time for things that we really need to do. We have nobody to blame but ourselves. But now we're ready to tame this beast!!! We have a vision of what we want the space to look like and I'm sharing that with you today. 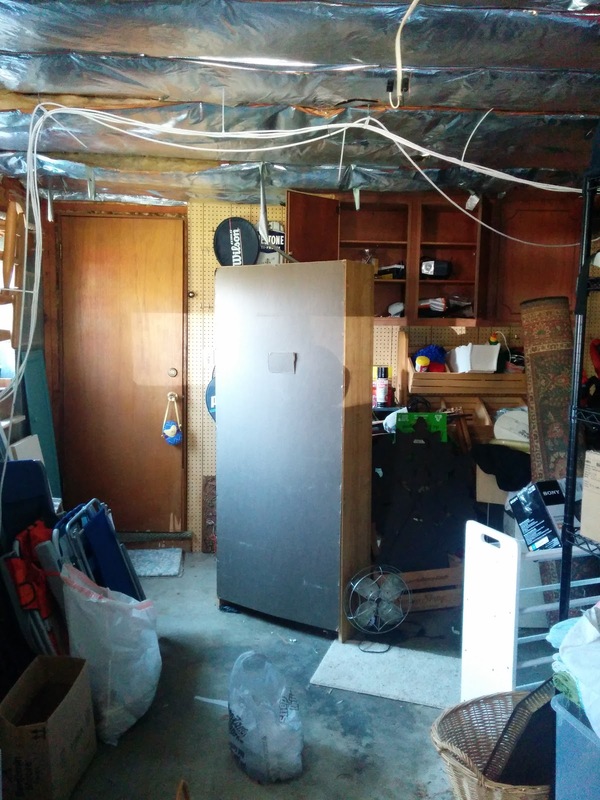 Hopefully you'll be inspired to tackle your garage after seeing what this space transforms into. 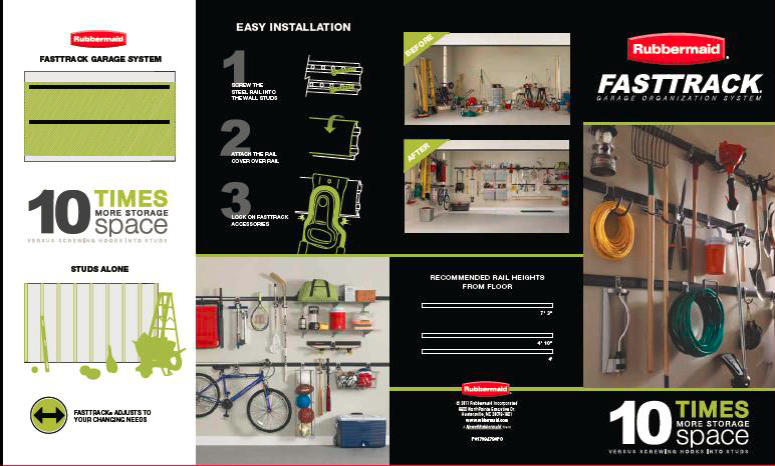 Since this project was already at the top of our spring to-do list, the timing couldn't have been more perfect when I was contacted about working with Newell Rubbermaid FastTrack garage organizing systems for a project. Bingo. Here we go. But where do I even begin? Ugh. 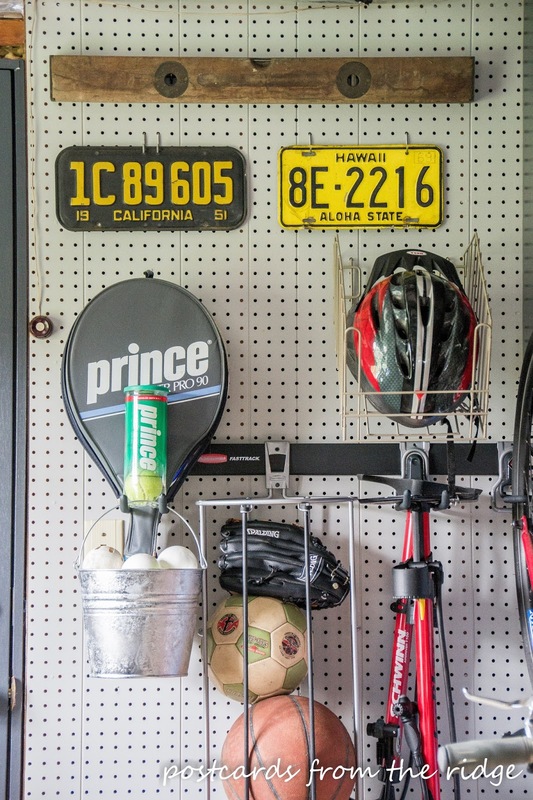 We knew this was going to be a challenge because we have so much stuff, but we really do want an organized garage! 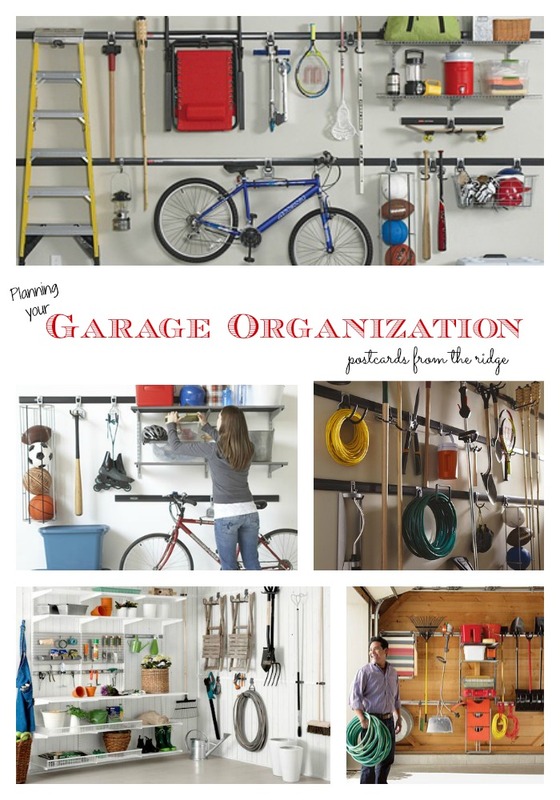 So we came up with a step-by-step plan for creating an organized garage and are well on our way to a functional, tidy, organized space. Here are the first 3 steps of our process, already complete. All of the organized garaged have things off the floor and have maximized the vertical space for storage. After coming up with a final vision for the space, we began the big purge. If you follow me on Instagram or Facebook, you've already seen some of the fun finds we've rediscovered in the garage. Some pretty cool things were hiding in there like vintage license plates, old road maps from the 40's and 50's, and more. It's been a bit like a treasure hunt! Finding interesting items has actually made the purging process more fun. It's still a chore, but at least we've had some highlights so far. FYI - if you're purging and have old cans of paint to get rid of, go here to find out what to do with them. Next step, gather the organizing hooks, shelves, baskets, etc. for the items not being purged. That's where the Newell Rubbermaid FastTrack system comes into play. We wanted to free up floor space and utilize the empty walls for storage and this was the perfect fit for us. I headed over to our local Home Depot to check it all out. 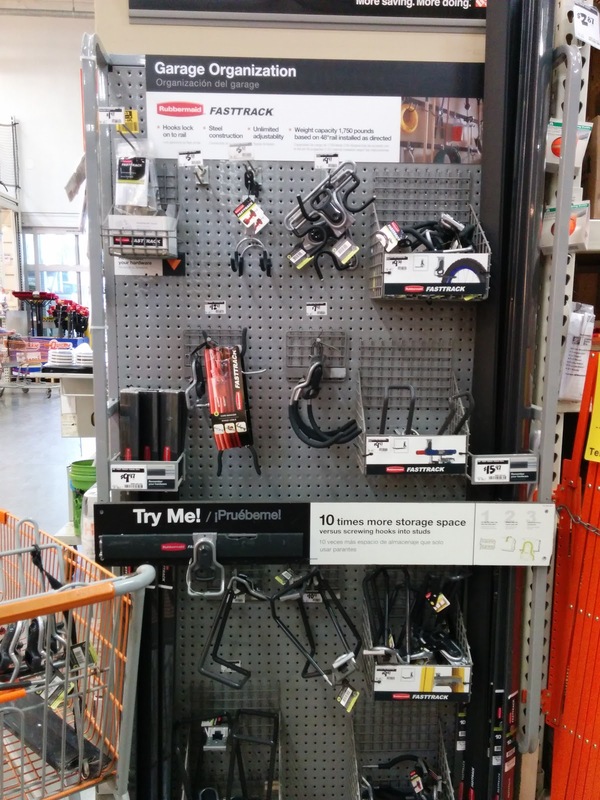 Back in the organizing area of the store was a wall of the FastTrack hooks and rails. There are several different hooks for holding various items. In addition to all-purpose hooks there are specialty hooks like a ladder hook, cooler hook, power tool hook, and even a bike hook. And you can try them out on the display. It's super easy to snap the hooks on and snap them off if you need to move them. 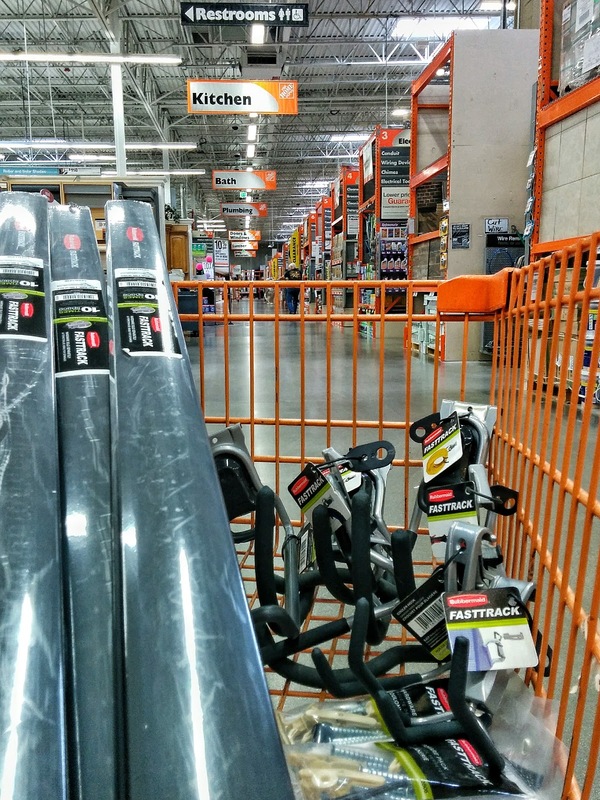 After determining which items would help us out the most, I added them to my cart and checked out, then headed home to begin the organization of the garage. Everything was fairly light weight and easy to get in and out of my car by myself. And just so you know, I'm installing them by myself as well. All I need is my drill, a level and some motivation! Well, plus a ladder. Ladies, you can install this system by yourself, too! Here's a sneak peek at some of the progress. Yes, this really is the same space I showed you above. Not only is it much more organized, we also painted it to brighten it up. And do you see those vintage license plates? We found those inside of an old piece of furniture that belonged to my husband's parents. So. Stinking. Cool. We're still working on it and will show the full reveal of this phase next week. We're so happy to have made such progress in here. Check back next week to see the final steps and the complete transformation we've made in here. You don't want to miss this. So how about you? What's the messiest space in your home? This is a sponsored conversation written by me on behalf of Newell Rubbermaid. The opinions and text are all mine.